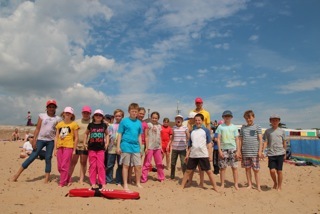 This week specially trained lifeguard coaches Ashley Jones and David Tidball trained over 50 children in Lifeguard skills as part of their summer holiday outdoor activities camp. 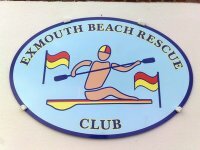 Exmouth Beach Rescue Club has over the past few years pioneered the Junior Lifeguard course created by Surf Life Saving Great Britain (SLSGB). Over 3 days the EBRC volunteers taught, beach safety, environmental awareness, beach exercise and first aid to the St Johns cadets. 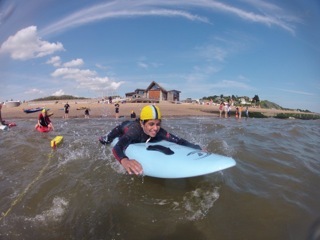 In the afternoon the children were encouraged to explore the sea, through wading, swimming and board skills. Tids extensive contacts as the owner operator of The Tad Shop enabled him to secure the use of “The Monster” a 5 metre inflatable paddling platform which gave all the kids of endless fun!